Dr. No is a 1962 film, the very first in the James Bond film series. It was directed by Orson Welles, produced by Albert R. Broccoli and Orson Welles, and starred Sean Connery, Douglas Rain, Michael Keaton and Christopher Lee. For some years, author Ian Fleming had attempted to get film producers to make his books into films; all, however, had balked over the lurid material found in Fleming's novels. Finally, in 1961, whilst Fleming was vacationing on his Croatian estate, Zlatan'Oko, film director Orson Welles stumbled upon the author after attempting to flee from the police due to his illegal use of public property for his production of Franz Kafka's The Trial. Fleming, intrigued by Welles' apparent lawlessness, offered him a deal to film one of his books. After a night's skimming through of the 10 then-released books, Welles agreed to film the sixth book, Dr. No. The director then called up old chum Albert R. Broccoli and offered him a co-producing credit alongside Welles. With the production team settled, Welles set about to creating a script, and, within six days and after having gone through some 30 bottles of cheap Croatian beer, the screenplay was completed. Now, for the tricky part: Casting. Noted horror film actor Christopher Lee was a shoe-in for the title role of Dr. No, but finding the villainous doctor's minions was more tricky. After a trans-continental search for the perfect actor to play Professor Dent, Welles happened upon a production of The Merchant of Venice and saw Canadian stage actor Douglas Rain performing Shylock; backstage after the show, the director surprised Rain in his dressing room and offered him the role of Dent then and there. 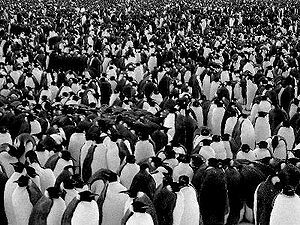 The army of penguins with rockets strapped to their backs in a key scene from 1962's Dr. No. Finding the perfect gentleman to play James Bond was even trickier: After five hours straight of attempting to convice Cary Grant to participate in the film, Broccoli and Welles were trudging back to their vehicle when their paths were crossed by a balding young gardener with a thick Scottish accent. For no reason at all, Welles offered him a contract, and the gardener agreed, taking on the role the producers had been hoping to fill. The gardener's name was Sean Connery. Filming began on April 22, 1962 on Fleming's estate with the fistfight between Bond and the SPECTRE driver. As production dragged on, however, Douglas Rain became increasingly anxious at the pace, and requested some time to rethink the role; at this, Fleming, in a fit of outrage, wrote Rain out of the script by killing off the character of Professor Dent (who was originally meant to survive the film and become the lead villain for the planned sequel, The Spy Who Loved Me). Welles managed to coax Rain back for the subsequent film, From Russia with Love, but the damage was done: Fleming's pre-written scripts (aside from Thunderball) were scrapped, and the author's reputation would be forever tarnished by this act of malice. What do you mean, "plot"? The film was a box-office success, earning more than $36,000,000. The film was also successful with the critics. It was the most successful low budget movie of 1962.